Skin is the most sensitive part of our body. Everybody wants to look beautiful and healthy. We need to pay proper attention to our skin in order to have beautiful and glowing skin. Some plants have natural anti-ageing and healing properties. These can also be used to treat many diseases. Natural ingredients extracted from these plants can tonned-up your skin and provide you a radiant look too. Neem “ Neem leaves contain essential ingredient like nimbin, nimandial, nimbinen and many other compounds that have anti- inflammatory, anti-fungal and anti-bacterial agents. It is having most powerful anti-fungal agent that destroys fungi which causes ringworm and nail fungus. Neem leaves are often used to treat viral diseases. Its extract absorbs and eliminates virus. These plants are also very much effective in curing malaria fevers, poison, and cancer. It is used for curing tumor cells as well. Due to its anti viral properties, boiled Neem leaves are used for bathing. It works wonder for those who are suffering from some skin related problems, itching and irritation due to some fungal infection. It is also used for moisturizing skin, acne. 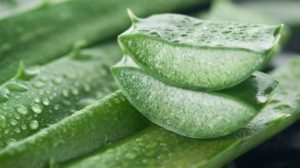 Aloe Vera – It is the most commonly seen plant. One can witness its presence in every second house in our area. The reason behind placing aloe Vera in our home is its main property like, air purifying. The plant is useful to relieve sunburn, acne skin dryness. Aloe Vera also improves digestive system, strengthens the immune system and heals wounds in quick manner. Rosemary “ These plants contains essential oil, which is mostly used for moisturizing skin. It also contains anti-fungal and antiseptic properties for which many of us use chemical and artificial cosmetic products. These plants are also beneficial in improving concentration, digestion and brain aging issue. It also acts as anti tumor agent. Lavenders “ Lavenders plants, commonly known for its fragrance providing a restful sleep. Many of us may not know that it is one of the effective skin healing plants which help to reduce skin irritation problems. It also eliminates dandruff and helps to reduce hair fall. These plants are beneficial for healing stomach related problems too.